How large of a group you cook for at the campground. The types of meals you typically prepare. The amount of space you have to store your camping gear. How much weight you can and are willing to store and carry. What you actually need and use. And remember that this could change, and that is okay too. If you decide that you need a change, no problem. You can always add gear and make those changes as you see you need them. Sell the gear you aren't using. Its not that big of a deal. Someone is always looking to purchase second hand camping gear online! 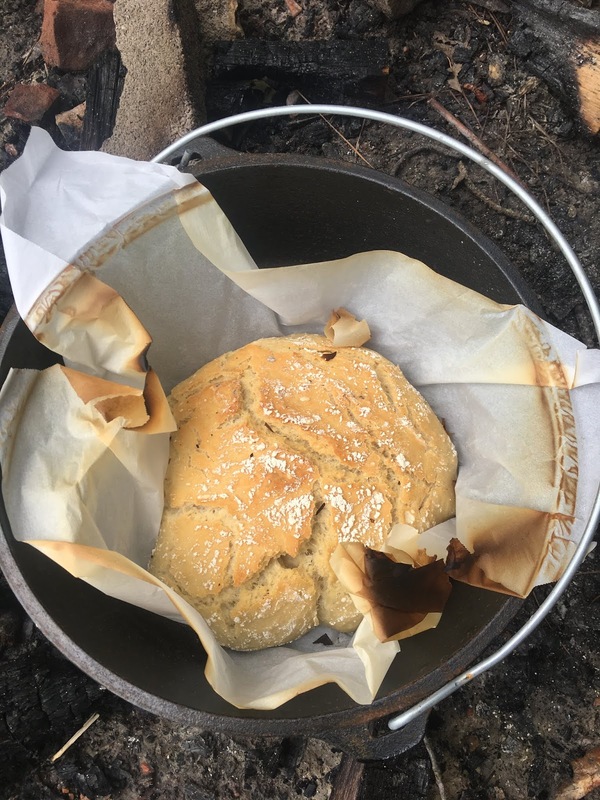 I started using our Dutch Oven on our first camping trip with canned cinnamon rolls. And we still use it. The Lodge Dutch Oven is an awesome piece of camping gear. It will literally cook any and everything. You can use it to bake, braise, fry, saute, or roast your food. It is a true jack of all trades. For this reason alone, it is a tool that many campers love and use. It is also something that will outlast you. It is virtually indestructible. However, these pieces are fairly large. They take up a good bit of space and are heavy. My only complaint about using these is that you have to heat up coals to cook so its a time commitment to cook a meal in them. Sit back and relax. You aren't going anywhere any time soon. I don't mind this except when I am starting my day usually. I don't want to start my morning with charcoal. Now your food will turn out great. They are easy to cook in. Once you perfect your craft, you will feel like a campground boss. I recommend using a Dutch Oven App to help you determine how many coals you need on top and bottom to regulate the heate. Dutch ovens can work for big groups or small families. There really is no size limit on this since you can buy the size you need. It is versatile on so many levels. 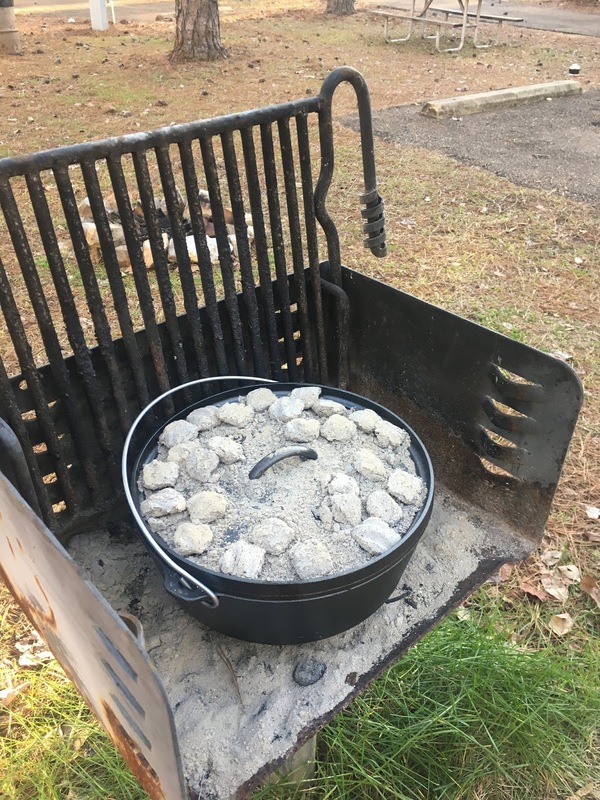 If you are willing to haul a big piece of gear that needs charcoal to heat it up, then the Dutch oven is the piece of gear for you. And none of this is critical. It is just the things that you need to consider before you dive into Dutch oven cooking. I have added the Coleman Camp Oven to our gear last year and have grown to love it as much as our Dutch Oven. Coleman makes this little portable oven that folds down flat to store. You expand the little box and fit it over a propane burner to bake. It's a handy quick way to bake at the campground. I love it for lots of different things. It's an easy way to make biscuits at the campground in the morning. You can also use it to make muffins or anything else that would typically go in an oven. You will need a compact set of baking ware to use inside due to the size. So this will limit you and require a secondary purchase on the front end. But, these are small, and I didn't mind. Since it is lightweight and portable, it takes up little space and works great for anyone that has little to spare. There is a temperature gauge on the front that works just like a home oven in many respects. Most every camp set up is going to have a propane stove. So, this is something that is going to naturally work for anyone with ease. The size of this oven does limit you. It isn't going to work great for a huge group. This oven works better for couples or small families. Otherwise, you are going to be baking in batches. But, it is still a handy little tool! 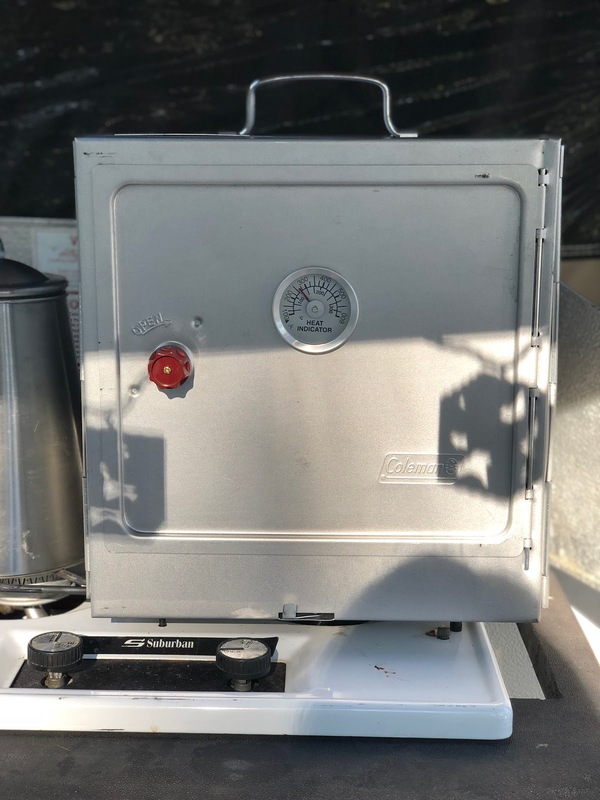 The Coleman Camp Oven is for anyone that has a propane stove set up that cook for small groups. This works for anyone that wants to bake something quick. But, you need to make sure that you have a nice BTU stove to do it. Smaller BTU stoves will take forever to heat up and won't yield great results. Keep all of this in mind. When you compare the two items, there are pros and cons to each. Deciding between the two is hard, and you may decide that you need both. We have both and love them! 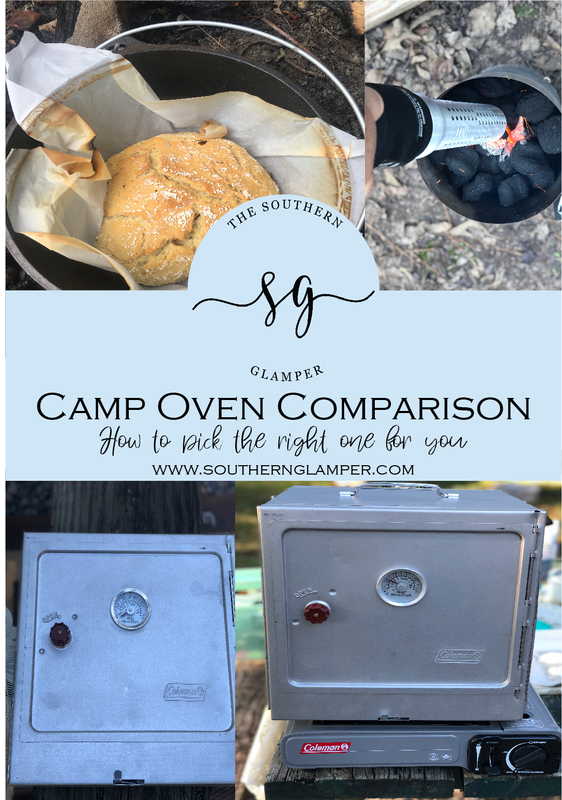 So, which one is the best oven for camping? Well, for us it is both. I still use both. I still like our dutch oven. I use it for evening meals where we are not in a hurry and can start it early and kick back. I have grown to enjoy using the Coleman Camp Oven in the morning to make biscuits and quick items. We have room for both. Plus I cook enough at the campground to justify the need for both. With both, there is a learning curve. You are not cooking in your traditional home oven. Do not think that it will be the same. Be patient and give yourself the time to learn, otherwise, you will be severely disappointed no matter what you purchase. I'd love to hear from you and what you use at the campground. If you are in a pop-up camper and don't have a big kitchen it makes your cooking needs a little different. I'd love to hear from you!